The DANA Nozzle, is a no nonsense, light-weight, compact nozzle. Originally designed for use with foam/water and dry chemical, it has now been redesigned to deliver Halotron instead of dry chemical. The nozzle body and handles are constructed of heat treated aluminum and powder coated for a long lasting finish. The threaded swivel inlets and shut-off valves are constructed of anodized aluminum. The shut-off handles easily operate ball valves at normal discharge pressures. All O-rings and gaskets are the highest rated compatible material for Halotron. The discharge rate of this nozzle is 5 – 7 PPS, and foam solution rates up to 100 GPM. The foam discharge nozzle is infi nitely adjustable between a straight stream and a fog pattern. The SA Nozzle is a no nonsense, lightweight, compact nozzle. Originally designed for use with dry chemical, it has now been redesigned to deliver Halotron. The nozzle body and handle are constructed of heat treated aluminum and powder coated for a long lasting finish. The threaded swivel inlet and shut-off valve are constructed of anodized aluminum. 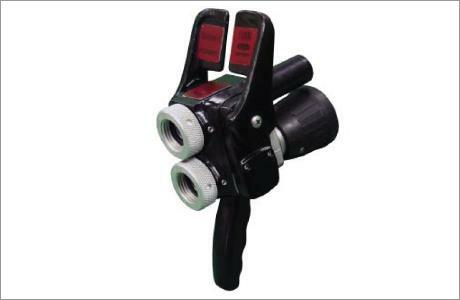 The shut-off handle easily operates the ball valve at normal discharge pressures. All O-rings and gaskets are the highest rated compatible material for Halotron. The discharge rate of this nozzle is 5 – 7 PPS. Website developed by Prominent Media Ltd.